They say "talk is cheap" - and these days it seems like every major US wireless carrier is claiming to have the fastest 4G (of course 4G is a highly debatable marketing term that describes three vastly different networks, but that's fodder for another post altogether). It's relatively easy to tune all of the marketing hype out but, when presented with some solid numbers, it gets easier to pay attention. 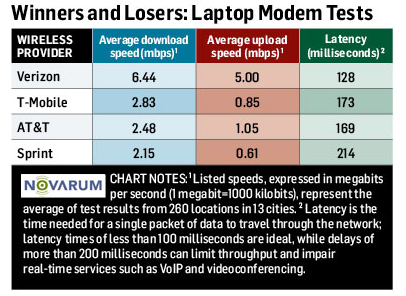 PC World has tried to give us some raw data to work with in their profiling of the data speeds on the four major providers. PC World measured the best service they could get (whether 3G or 4G) over 260 locations in 13 cities. 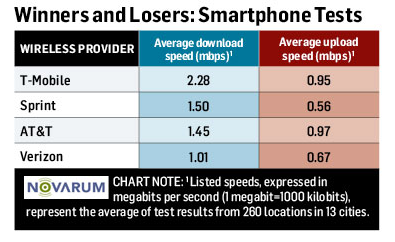 So the prevalence of 4G is just as important as the speed in determining these averages. With that said, you can see in the results below that T-Mobile came out on top in the smartphone category, averaging 2.28 mbps download and 0.95 mbps on the upstream. We would advise you to take these results with many grains of salt. "4G" networks are a work in progress which have only rolled out in select markets, and results will vary wildly based on location. For example, in Chicago I usually average about 4-7 mbps download and 1.2 mbps upload on Sprint's WiMax network - this differs radically from PC World's findings. Nevertheless, it is interesting to see how one study stacks up. We will look forward to seeing a similar survey next year (when networks are more complete and Verizon actually has some LTE phones on the market).